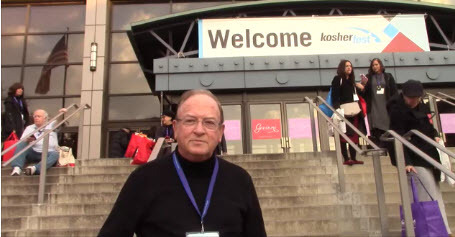 Today we're bringing you part two of our report from Kosherfest 2016. On Tuesday, the first day of the show, we interviewed representatives of companies exhibiting a variety of products, some of which were prize winners and others that just appealed to us as being unusual or of special interest. We posted five segments yesterday and another four today. The products are Unorthodox Wines from South Africa, Cheesecake cones, Kosher Sake from Japan, Asian Meals in a Box, Seaweed Chips, Dyna-Sea Surimi Imitation Crab Cakes, Kosher Korean Kimchi, Smartfruit drinks, Manischewitz Matzo S'mores and Matzo Pizza Kits for Kids. More than 400 exhibitors lined both sides of seven aisles to vie for the attention of visitors (trade only -- but some kiddush aficionados seem to have found their way into the hall) who tried to manage noshing and stuffing literature into the bags provided by some vendors (and rolling suitcases brought by attendees). And there was plenty to nosh and to stuff. Some of the samples were meat, some were dairy, and some were pareve. But all three types were scattered around the show floor, so anyone trying to keep kosher had to make careful choices. We apologize for the loud background noise from the 6,000 attendees milling about the exhibit space while we were conducting the interviews. I apologized in the post for the quality of the audio. I'm doing the best I can with the equipment I have. Most readers understand and are happy to have the content even though it's a bit hard to understand all the dialogue amidst the noise generated by 6000 people talking and munching. Love your posts. Different subjects which make it so interesting..